Eliana goes to preschool for a full day two days a week. Those are my dedicated “work days” to focus on teeny tiny foodie rather than every other day when I split my time between taking care of Eliana and cramming in some teeny tiny foodie work here and there. To maximize my work time on these days, I try to plan an efficient lunch for myself that consists of heating up leftovers or assembling something in 10 minutes or less. This Green Pizza is one of my go to “efficient lunches”. It’s super yummy and is packed with iron, calcium and fiber. If you’re thinking ahead to enjoying a green meal in honor of St. Patrick’s Day next week, here’s a recipe for you to consider. If you’re using my recipe for homemade pizza dough, please note that you will bake the pizza at 425°F not 450°F. 1. Heat the oven to 450°. If you’re using a pizza stone: put it into the oven to heat up while the oven warms. If you’re using a baking sheet: you don’t need to preheat the baking sheet. Lightly oil the baking sheet with high-heat vegetable oil for use later in the recipe. Place the pizza dough onto the stone or baking sheet and bake it for 2 minutes. Carefully remove the pizza from the oven. If you’re using a pizza stone: top the dough with mozzarella cheese and a little bit of parmesan cheese and return to the oven for 10-12 minutes. If you’re using a baking sheet: flip the pizza dough and top with mozzarella cheese and a little bit of parmesan cheese. Return to the oven and bake for 10-12 minutes. Chop the spinach into smaller pieces and place into a bowl. Squeeze lemon juice over the top and add a pinch each of salt and pepper. Pour a drizzle of olive oil over the top. Toss, taste and adjust flavors as desired. Set aside. Remove pizza from the oven and top with the spinach salad, more parmesan cheese and red pepper flakes, if using. Let sit for 1 minute. 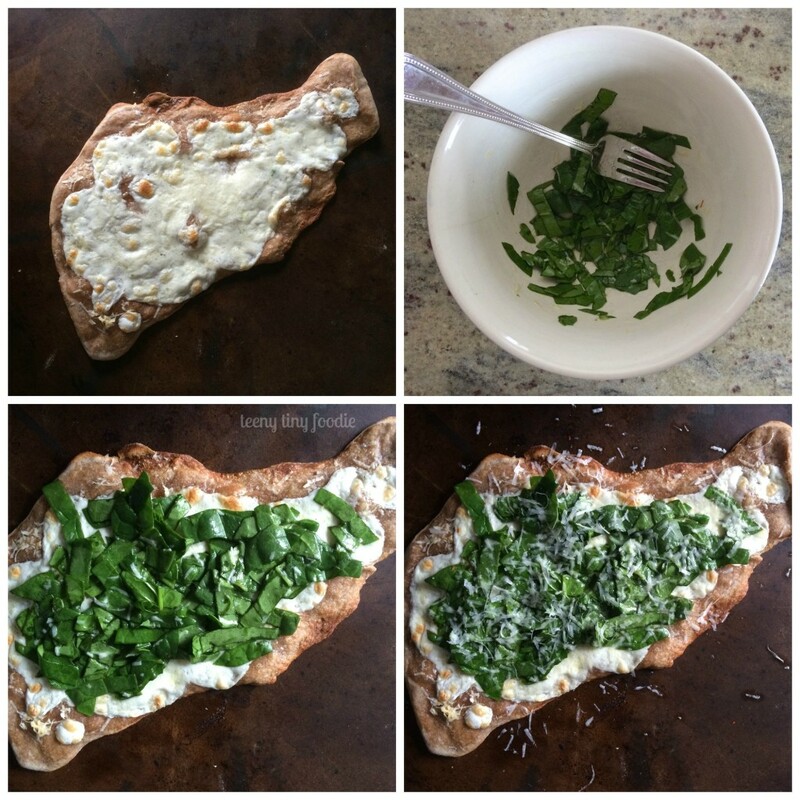 Slice pizza into small pieces and enjoy! 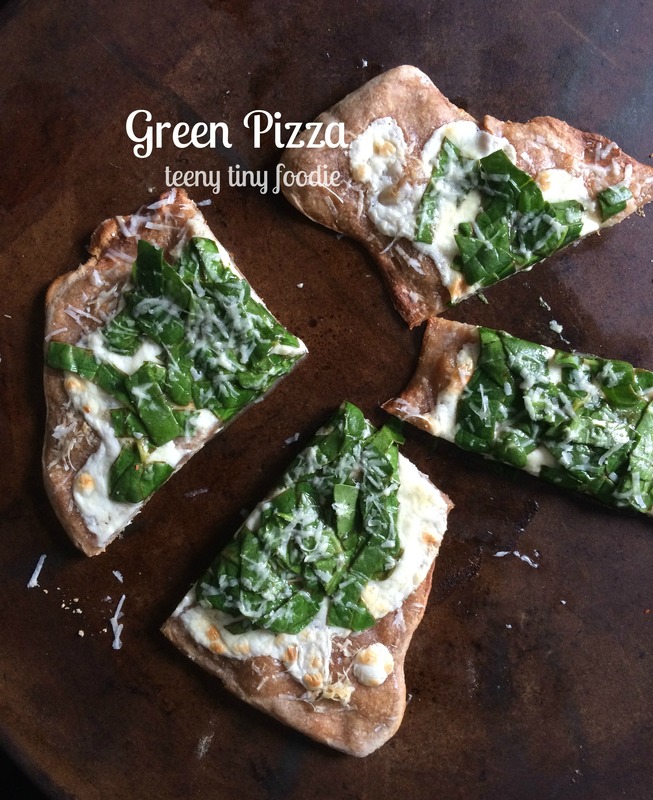 For other “green colored” recipes, click here!